Successor to the Zonda, the £1.3million Pagani Cinque appeared at the MPH Show featuring Top Gear Live at Earls Court from 5th to 8th November 2009. Only five examples of the Pagani Cinque exist in the world. The lightweight carbon-titanium Pagani Cinque is powered by a 7.3 litre V12 AMG engine that produces 678BHP. Although all the power is transmitted to the rear-wheels, the Pagani Cinque is capable of powering the driver to 62mph in 3.4 seconds, 125mph in 10 seconds and on to a top speed of approximately 220mph. Carbon ceramic brakes can bring the car from 125mph to a complete standstill in just 4.3 seconds. Inside the cockpit a roll cage is fitted along with four-point harness carbon-fibre-leather racing seats and F1-style paddle gear shift - that can change gear in 100 milliseconds. At 186mph the rear wing, front spoiler, new rear diffuser and modified air flow beneath the car combine to produce 750kg of downforce, gluing it to the road. At each corner of the Pagani Cinque are ultra-lightweight aluminium and magnesium wheels shod with Pirelli P-Zero tyres. 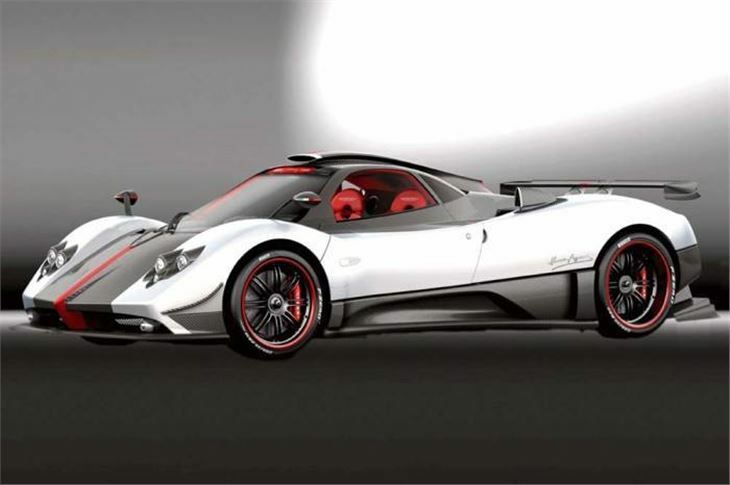 Together they help this version of the Zonda pull up to 1.45G in bends - around twice that of a high performance hatchback.